ADHENTUS (ABDERITUS, ADERY), (Second Century), a native of Greece, he served as the second Bishop of Ravenna, succeeding St. Apollinaris (23rd July). St. Adhentus’ relics are enshrined in the Basilica of Sant'Apollinare in Classe near Ravenna. ADOLPHUS and JOHN, two brothers, sons of a Muslim father and a Christian mother. SS. 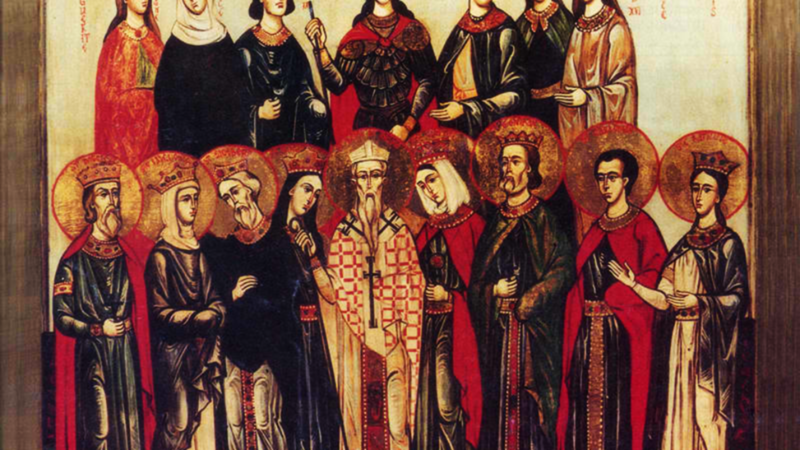 Adolphus and John were martyred after being caught up in the persecutions conducted by Emir Abd ar-Rahman II in Córdoba circa 850. BARROG (BARRWG, BARNOCH, BARRY), (Seventh Century), St. Barrog was a disciple of St. Cadoc of Wales (24th January), and is the namesake of Barry Island off the coast of Glamorgan, where he lived as an anchorite. CERAUNUS (CERAN), sixth Bishop of Paris who reposed circa 614, his relics are enshrined in the church of St. Geneviève in Paris. DEODATUS, (Date Unknown), a martyr in Sora in central Italy, whose relics were enshrined in the cathedral there in 1621. No further information on his life is extant. FIDENTIUS and TERENCE, (Date Unknown), martyrs whose relics were discovered in the twelfth century at Todi in central Italy. There is no further information extant. FLORENTINUS and HILARY, (Date Uncertain), two hermits martyred in France by the Vandal invaders of Gaul. Though there is some debate as to most of the details of their lives, it is agreed they had their tongues were torn out before their being beheaded. GAIUS of MILAN, (First Century), very little is known with any certainty about St. Gaius. He is thought to have been a spiritual child of the Apostle Barnabas, and was the third Bishop of Milan. He served that See for twenty-four years, and is believed to have baptised St. Vitalis (28th April) and SS. Gervase and Protase (19th June). HILTRUDE, daughter of a Poitevin nobleman, who lived as a hermit near Liessies Abbey, in present-day Nord-Pas-de-Calais France, under the spiritual direction of her brother, Gunrad, who was Abbot. St. Hiltrude reposed circa 790. MARCELLUS, a native of either Scotland or Ireland who was a monk at Abbey of Saint Gall (Abtei St. Gallen) in Switzerland. St. Marcellus reposed circa 869.